A spacious suite with a sunken living room. A bed chamber and two plush queen-size pillow-top beds. Spend a night or awhile at The Venetian Resort's two signature towers. Best rate guaranteed. Free cancellations. Access to exclusive offers. On May 9-12, celebrate 13 years of culinary excellence with new events as guests from around the world indulge in an epicurean experience of a lifetime at Vegas Uncork'd. The Dorsey Sessions are a series of pop-up events featuring noteworthy visiting bartenders from across the world. You’ll have everything you need to enjoy a glorious summer day in Las Vegas. Our new Venetian Meetings Virtual Planner® lets you explore, customize and visualize the perfect space for all of your meetings, convention and trade show needs. Choose from the most extensive selection of the hottest slot machines or take a seat at your favorite table game in Las Vegas. Want the World The whole world, all in one place. "Absolutely the Best Hotel for your Money in Las Vegas"
I've been to Las Vegas 5 times and this hotel is at the top of my list. From location on the strip, cleanliness of the hotel, theme/personality of the hotel, restaurants, staff, etc... everything is wonderful. A tribute to the Italian opulence, warmth and lust-for-life that informs each and every day. The center of a modern renaissance, every experience invites you to open your mind to what luxury can mean. At almost twice the size of your average Las Vegas hotel room, The Venetian offers the largest standard suite on the Strip. Stretch out in an oversized, pillow-top king bed, entertain in your distinct living room, or soak in your oversized tub. Choose a room with a view to enjoy the Las Vegas lights. 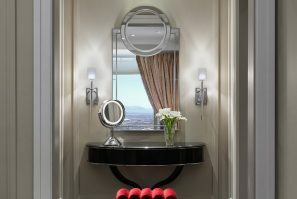 Step up to one of our most impeccable suites, and one of the finest on the Strip. Each Bella Suite is approximately 700 square feet with a bed chamber and two plush queen-size pillow-top beds. You’ll nestle into Egyptian cotton sheets and have a remote control for the Roman shades to set your mood. Soak in a Roman tub in a warm, opulent setting. As you enter the double-door entrance into an Italian marble foyer, you’ll feel right at home in the Rialto Suite, located at one of the most exciting crossroads of the Strip. You’ll revel in the plush, queen-size pillow-top beds, Egyptian cotton sheets, and a spacious walk-in closet. You can also take advantage of a work area, with dual-line phone, wireless Internet access, and comfortable seating. Piazza Suites emit grace, elegance, and the highest levels of comfort you’d expect from a luxury resort, right on the Strip. This impeccable suite features a king-size bed with body-soothing Egyptian cotton sheets, and a jetted tub with separate glass-enclosed shower. This is a truly plush, sprawling suite with everything you need for the perfect stay at a world-class resort on the Las Vegas Strip. You’ll love a semi-formal dining room, jetted tub, a large separate glass shower with two showerheads and seating area. There’s also a full bar with seating area and high-definition TV and a stocked refreshment center. At almost twice the size of your average Las Vegas hotel room, the Luxury Suite is the largest standard suite on the Strip. A favorite with families and business travelers due to its extra space in the bedroom, the Bella Suite is our standard suite accommodation with two queen beds. 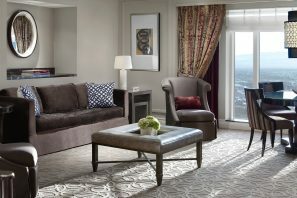 The richly appointed Siena Suite is 1,280 square feet of pure elegance, right on the Strip. A marble foyer, complete with a powder room for guests, flows into a sumptuous living room, where a comfortable couch, dining table, and wet bar set an inviting backdrop for entertaining. 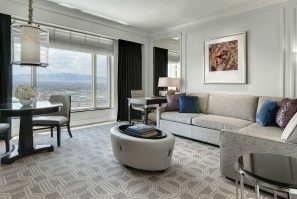 Make yourself at home in our 940-square-foot Fortuna Suite, right on the Strip. This upgrade from our standard suite adds a lovely sitting area with comfortable arm chairs, where you can enjoy a cocktail in the privacy of your own. Whether you like to plan ahead or want to linger a little longer, take advantage of exclusive offers for special rates you won't find anywhere else. When you stay at The Venetian, you’re not just staying in a hotel, you’re entering a new state-of-mind. One where the whole world is on the table, if you want it. The whole world, all in one place. The Venetian Resort Las Vegas is more than a hotel, it’s a playground of your own design. A place where individualism rules over rules and where everyone’s invited because there are over seven thousand suites. When you stay at The Venetian, you’re entering a new state-of-mind. One where the whole world is available to you, if you want it. Chef Wolfgang Puck developed his bold, innovative style of cooking while working in some of France's most celebrated restaurants: Maxim's in Paris and the Michelin 3-starred L'Oustau de Baumanière in Provence. A house of worship to farm-fresh ingredients, classic Southern cooking, culture and hospitality. There’s so much to see and it’s all in walking distance from your suite. From hand-painted frescos to award-winning restaurants and lounges, there’s a little bit of everything for everyone to enjoy. Few cities, ancient or modern, can claim such distinctive and historically important icons and constructions in such a relatively small area as can Venice, Italy with its St. Mark’s Square. Rosina welcomes those who see the world a little differently, who place more emphasis on the true pleasures in life. With its stunning décor and push-button Champagne delivery, Rosina offers a mixing and mingling experience that is as unique as it is you. Provide the information below to access our Exclusive Offers. These offers may be available for a limited time and not available in the future. To access exclusive offers from a different browser or device, enter your information again to get instant access. , your special offer has been unlocked and is available right now. Always the best rates guaranteed.